Fresh apricot fruit food pictures, photos & images. 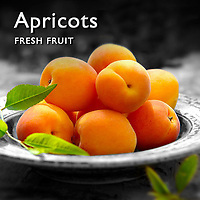 Apricot is the fruit from the Prunus armeniaca,. Its origins are unknown but was described in antiquity in Armenia and Persia. The apricot was introduced into Greece by Alexander the Great. The apricot is a delicate flavoured fruit that can be eaten fresh, cooked or dried. When cooked apricots do not loose their nutrients and the dried fruit is added to muesli as a health food.